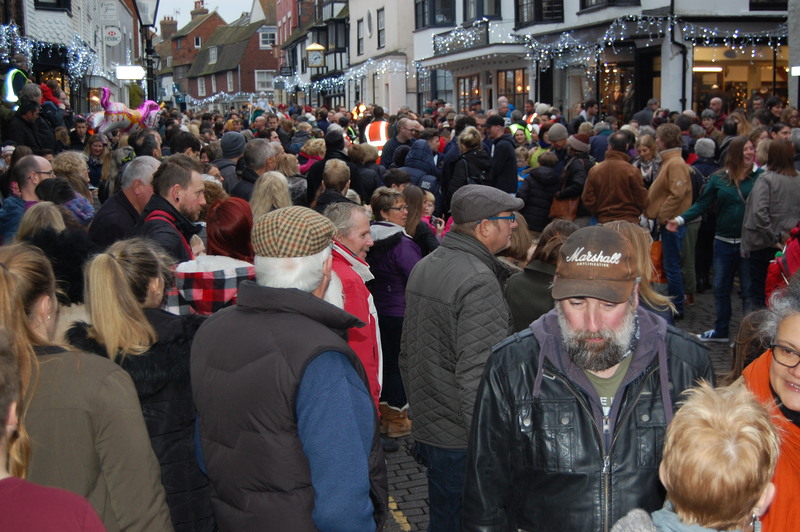 The Rye Christmas Festival saw a repeat success in our second year of running this community event. After organising such a successful event in our first year, the pressure was on to offer something which did not disappoint. It is not possible to know the numbers of visitors we had to the town that day but all I can judge it on is that I have lived in Rye my entire life and I have never before seen the town so busy for the entire duration of a day. You only had to be in the High Street for the races to see the sheer quantity of people in town. There were certain elements which were easier in our second year – we had already formed relationships with lots of the suppliers, sponsors and groups who were involved and this is something which takes a great deal of time. Lessons had been learned and while there were not many, we were aware of areas for improvement. One job that does not get easier each year is fundraising. There are certain grants that were only applicable to us in our first year but others we have to seek out. The competition with Blachere we entered, winning £1,000 worth of lights, helped. The fact that we made such an impression on the organisers that we were subsequently donated another £16,000 worth of lights was the icing on the cake last year! We now have great quality lighting in our own safe and secure storage which can be used year after year. Such a large proportion of the event’s costs are covered thanks to the generosity of local business sponsors and we truly hope that they feel it is money well spent. With feedback from 2015 reassuring us that we were on the right track and that our mission “to create a community event which offers something for every age, ability and budget” succeeded meant we had to hold on to those things. 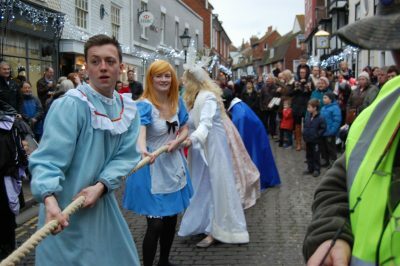 We rebooked elements and features that worked well; the pantomime returned, as did Mother Christmas, art workshops, the Carol Concert, the reindeer and the grotto at Rye Castle Museum. Larger attractions were added for 2016. The new location we managed to get at the Cattle Market meant that we were able to find a place for such a large feature as the carousel. We welcomed the donkeys of Camber, improved on the procession and we had many more local businesses come to us to say that they were putting on something special for the day. These included Waves Estates, A Slice of Rye and Merchant Mills. The market was an area we improved on. In 2015 the Strand Quay was very blustery and stallholders had to supply their own tables and gazebos, which were not tethered. To improve on this in 2016, we paid for the use of some of the farmer’s market stalls so that stallholders could arrive and simply set out their wares. We also added a PA so that there was some background music to add to the atmosphere down there. We have had some feedback from stallholders wishing to pitch in the High Street. While we appreciate that this may be an area with heavier footfall, due to the procession and increasingly popular High Street Races, this is not something that we feel we can offer. We also like to stay aware and respectful of all those businesses and shops in the High Street and we encourage those who are situated there to bring some of their goods out onto tables in front of their shops to seize the heavy footfall on the day. This year, the committee has reshaped slightly due to the high level of commitment and donation of time involved. The committee never stops working on this event and are already well underway with planning the 2017 event. Come September it is almost a full-time job for the most involved committee members. As always with these things it is about sustaining it, to ensure that what we have started can continue for years to come. We reach out to anyone who would like to be a part of the team and feels they have a skill which may offer some help and relief at busy times. Please contact jen@christmasinrye.co.uk. How much it all costs to put on these festivities each year? The spend for 2016 was in excess of £25,000, the majority being spent on lights, but also bringing the various attractions to Rye for the day, plus the necessary licences and legal requirements. We raised a similar amount from grants, fundraisers, local businesses and residents, and of course takings on the day. Of particular note was a substantial and most welcome contribution from Rye Town Council which allowed us to push ahead with bringing key attractions on the day. The budget spend for 2017 is for a similar amount, and we have already started planning. To keep things fresh each year, the committee comes up with a new theme and commissions a local artist to create the poster image. We feel that it not only adds a variation to the years before but it also acts as an inspiration for the committee when curating this event and also to the public; the window displays last year proved how well the theme is taken on board, not to mention the amazing artworks that the school children created and the costumes that people wore for the procession. 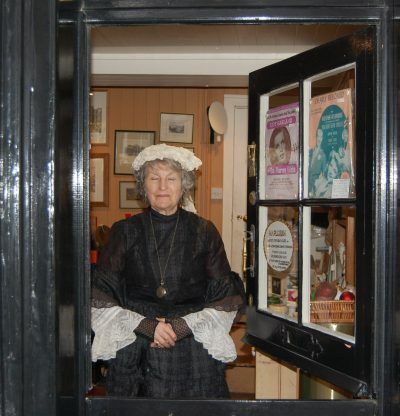 The themes so far: Dickensian in 2015, Tales of Old in 2016 and this year’s theme is soon to be announced so watch this space!